Thursday, March 17 at 12:30 p.m.
and repeated on Saturday, March 19 at 9:00 a.m.
Are you intimidated by paper piecing? Want to learn how to think "upside down and backwards?" 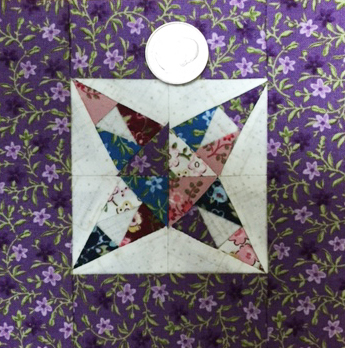 For our March demo days, Judy Bryan will share all of her favorite tips and tricks about paper piecing. Learn how to love this technique which results in perfectly precise points. Note: We placed the quarter in this image so that you can see the scale. 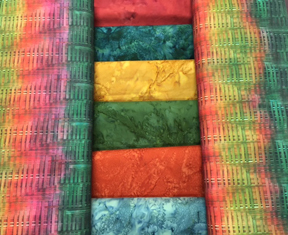 Saturday, March 19, 10:00 a.m. - 5:00 p.m.
Join us for day of sewing and fun on National Quilting Day. From 10 a.m. until 5 p.m. you can work on a new project or something you already have in the works. 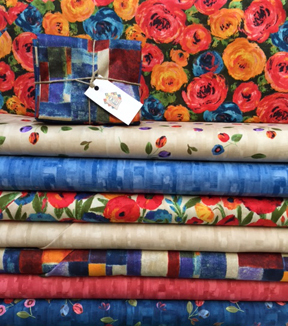 We'll have a quilting-related trivia contest with great prizes for those who are up on their quilting history. This event is free but limited to eight people so call us at 970-565-7541 today to reserve your space. The basket weave print in this collection is digitally printed. Rich and vivid. The coordinates are batik. What will you make with this? This beautiful spring group arrived last week. It has a watercolor feel. Nice! 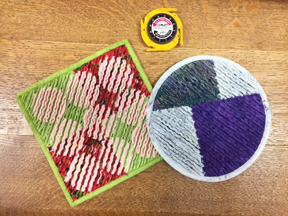 For our March In the Kitchen class we’ll be making the cute chenille potholders. Use the Olfa chenille cutter or a very sharp, pointy pair of scissors to make them just fluffy enough to be functional in the kitchen. These are quick and easy and you can probably make two or three during this half-day class. Judy Bryan will be your instructor. 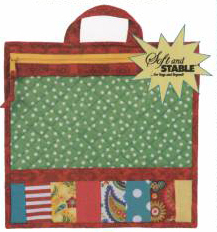 10:00 a. m. – 5:00 p.m.
A sturdy quilted base and fun fabric borders add interest to this handy tote. A zippered closure keeps everything safe and secure and a see-through vinyl window lets you see at a glance what’s in your bag. 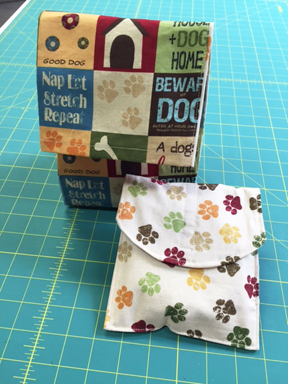 The pattern includes instructions for four different sizes. Aimee King will teach this class. 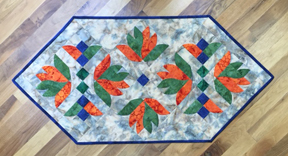 Make this beautiful 19″ x 42″ table runner in a Friday class with Judy Bryan as your teacher. The pattern is from Southwind Designs and features curves that are made by gently turning fabric back at the very end of the piecing process and top-stitching it down. Very easy once you know the technique. In this class students will learn the basics of applique by making an ice cream cone pillow. Image of the project will be posted soon. Aimee King will teach this class. 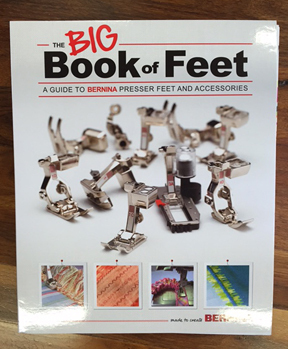 Join Cindy and Karen on Sunday, April 17 for a full day of hands-on learning about 16 different BERNINA presser feet. Feet Retreat will take you far beyond the basics when it comes to using the proper presser foot for the task at hand. Many BERNINA presser feet have multiple uses – some practical and some just flat-out fun. 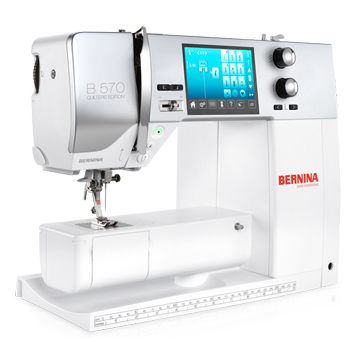 If you own a BERNINA (or if you’re thinking about investing in one) you won’t want miss this event. Feet Retreat is limited to six participants so call or come by today to reserve your space. Because you can never have too many ways to use an empty toilet paper roll . . . cord control! One of our customers brought her sewing machine in for service last week. When the tech got ready to work it, look what he found in her bag. Genius!